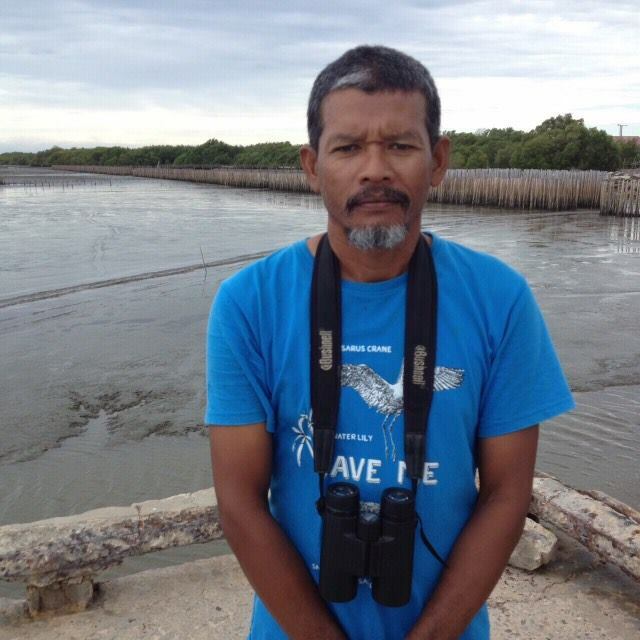 Mr. Tii (Suchart Daengpayon) started watching shorebirds in 1995. He is a resident of Khok Kham, Samut Sakhon, Thailand and probably the most adept finder of spoon-billed sandpipers around the Thai Inner Gulf. On behalf of the Bird Conservation Society of Thailand (BCST) he participated in the first surveys of coastal areas in Myanmar for spoon-billed sandpipers. He is extremely active in the Khok Kham Conservation Club, set up by local salt-farmers, and it was Tii who first raised the alarm when a company started to excavate land for a solar farm on 8 hectares of land in the Khok Kham Shorebird Reserve Network Site.